The valley among the picturesque hills, where Cypress Creek joins the Guadalupe River, possesses a charm, combined with the fertility of the soil that had attracted early settlers – mostly immigrants from Germany who had begun in earnest to arrive from their native land. Every ship from Europe landing on the Gulf of Mexico brought young men, who, weary of the iron-clad rules, of the many restrictions, and often oppression, eagerly joined such a settlement by casting their fate entirely into the unknown and unplanned future. These men, who had read and heard of the glorious prospects in South Texas, were all sturdy, thrifty Germans, mostly university trained, with M. D. and Ph. D. degrees, while others were geologists, botanists, architects, lawyers, surveyors, master mechanics, etc., and were provided with means sufficiently to help themselves. They did not come to be idle, therefore immediately went to work, surveying and building shelters. Upon arrival they found one lonely man in that vicinity, who welcomed them into his block house, and because they had been so graciously received and entertained, they concluded to call this spot "Comfort." Here is an excellent account of the early history of that special part of Texas. 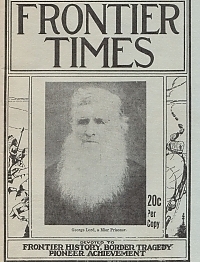 Accolades bestowed in abundance upon Mr. Hunter and his periodical, given at Frontier Times Museum in 1938. Detailed account of the various forms, techniques, patterns and significance of Indian ritual dance. This account, written in 1883 was the result of close association by Mr. Dodge to the actual rites and ceremonies. Mentions: * the great "medicine dance" of the Florida Seminoles * The Sioux also celebrated the "green corn dance" * The "scalp dance" * "coup-stick" * "Hoch-e-atyum," the "scalp dance," and "striking the post," * the `begging dance." * the "kissing dance. * The "sign dance" * the "eating dance." By Mrs. C. T. Traylor, Cuero, Texas. 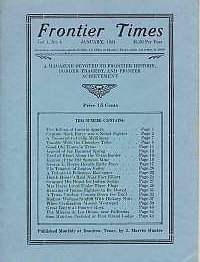 When a life work has been completed and its fruits have been garnered, the records of its incidents remain to tell the story of its success; and when the measure of that life has reached its ultimate limit of years, as well as its perfection in fulfillment of duty, a title to distinction has been earned. Such was the life and history of George Lord, whose honored memory claims the tribute of this fine article. George Lord was reared in England, where he received a very good education. He took passage for America in June, 1834, landed in Canada, and lived there two years. Then he went to New Orleans, where he worked on Mississippi steamers. In December, 1836, he joined a company of seventy-five men under Captain Lyons, and they came to Texas to take part in her war for independence, landing at Galveston in February, 1837. This very lengthy and detailed article also includes account of the Mier imprisonment written by Mr. Lord himself. 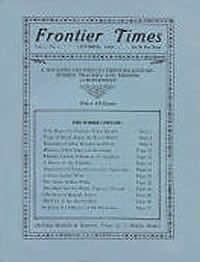 The article includes recorded statements of the men who drew the “black bean” and is one of the most detailed of the many accounts of the Mier incident that Frontier Times published. A single event, but it altered the fate of a nation. The fall of the Alamo, in the troublous days of 1836, was just one of the many events which clustered around the formal Declaration of Texas Independence. It was regarded then as another Mexican atrocity, and its greatest importance, no doubt, was to the families of those who died. The course of the revolution presented other scenes of horror to the eyes of the Texans, and for a time the importance of the struggle at the Alamo was not fully appreciated. More than half a century elapsed before the State Legislature saw fit to purchase the ruins of the old Alamo, and convert it into a fitting memorial to those men who hallowed it with their life blood and in death gave birth to Texas liberty and independence. This is the story. In the sand hills of Bastrop county is a town named Pettytown.-not that it is small, but because of the number of Pettys and their relatives living there - descendants of old John Petty, the original settler. John Petty came to Texas from Missouri long before the days of railroads, and raised his nineteen children in true pioneer style: Anderson, Jim, John, Jr. Gipson, Reilly, Jane, Ann, Johanna, Lavisa, Aislie, Minta and eight others whose names seem to have been lost with a big old family Bible, lived in a log house on the site of the present Central Texas town. Here is an excellent account of the Petty family history in Texas. By Colonel Martin L. Crimmins. Account of Mrs. Egbert L. Viele's impressions of her life at Ringgold Barracks in 1852-3. The post was first called Camp Ringgold, then Ringgold Barracks, and now is known as Fort Ringgold. “There's been plenty of powder and lead burned up on the pages of our Wild West literature. since the days when Jesse James, using two guns, girdled a tree while riding horseback at full speed; and "Wild Bill" Hickok fanned two guns from the hip to cut a perfect circle around the letter ...o... Fiction? Most assuredly! Those things never happened. 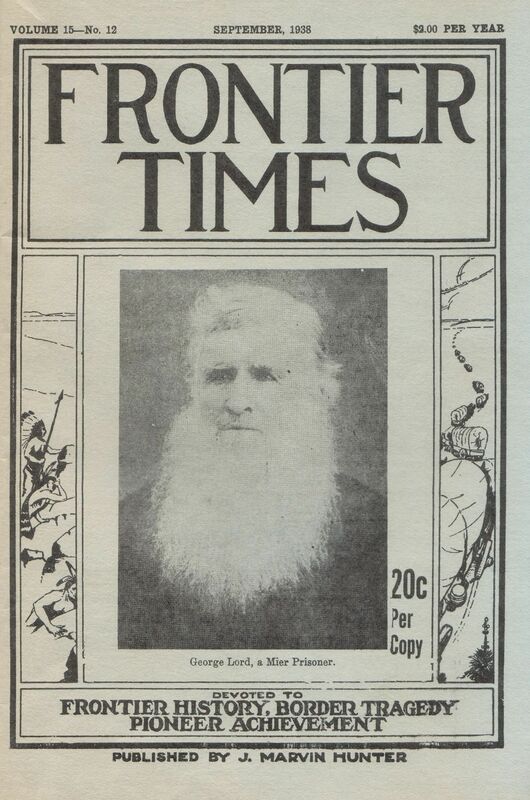 I have made it a hobby for many years to collect the "true" story of the gun men of our wild west, with the idea of bringing these supermen down to the rating of the human beings they were. 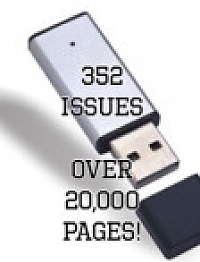 In the course of this research, correspondence, and conversations with old-timers, as well as available written material both in book and short story form has been collected. It has been my aim not to disparage these colorful characters that made the wild west, but to see them in proportion to their surroundings and not as the "True Westerns" paint them. To perhaps rob them of some of their glamor, but not to destroy their most important place in the history of the development of the west. In this department answers will be given to inquiries as to Texas history and other matters pertaining to the State and its people.